Biography of Makhan Singh, who translated Marx's Capital while in detention in India, was a central figure in Kenya's early trade union movement in the 1940s, was imprisoned for 16 years, then sidelined by Jomo Kenyatta's post-colonial government. Makhan Singh not only organised the labour movement in Kenya, but also raised the slogan of total independence of the country. He remained in prison for 16 years. But the contribution of this valiant son of Punjab remains unknown in Kenya as well as in India. He was born on December 27, 1913 in Gharjakh, a town near Gujranwala (Pakistan) in the family of Sudh Singh who went to Kenya in 1920, about two decades after the British took Indian labour to Kenya to lay the railway track from Mombasa to Kisumu to feed their commercial needs. In the 16th century the Portuguese had also imported workers from the then colony of theirs, Goa, to help build the coastal Fort Jesus. But it was in the last years of the 19th century when 37,000 workers and petty tradesmen were introduced from Punjab and Gujarat for the line that is termed by the African tribes and subsequently by Robert Hardy as The Iron Snake. The slithering of this ‘snake’, passing through the dense forests took life of about 2,500 workmen; roughly four persons per mile of the track. Another 6,500 were injured seriously. We have seen this terrain in the film made on the first-hand accounts written by John Henry Patterson in Man Eaters of Tsavo. It was against this background that Makhan Singh entered Kenya as a young student and did his London Matriculation in 1930 from Nairobi. He was a brilliant student. His class fellow Chuni Lal Madan, who later became the first Chief Justice of the Supreme Court of independent Kenya, wrote: “Makhan Singh had a magic brain and he used to excel in the subject of Mathematics”. He wanted to go to England for his higher education but his father insisted that he should assist him in the printing jobs in his newly established press. The financial condition of his family compelled him to work for the press. But he accepted it only as a paid worker against fixed wages. His later life would reveal that it was not his arrogance; he, in fact, penciled his roadmap for future activities. The mid-1930s played a decisive role in shaping his fortitude. In 1933, from being permanently employed with the Railways, the Indian workers were reduced to the level of being temporarily employed. When Makhan Singh was asked to become the Honorary Secretary of the Indian Labour Trade Union under the Presidentship of Ghulam Mohammad, their strikes of 1931, 33 and 35 had already failed. He started looking at the developments in the larger context and never restricted himself to parochial issues. Resolutions such as reduction of working hours to eight, reduction in the high taxes that workers were paying, and condemnation of executions done by Hitler were passed. Gradually, the scope of the union work was further extended to the whole of East Africa; name of the Union was accordingly amended. He started working in collaboration with his African counterparts and also Gujarati nationalists like Ambu Patel. He even warned Indians against their social biases of caste, creed, gender and nationality whereas he supported positive measures taken by the British like combining Kenya, Tanzania and Uganda as a single administrative unit. But he was dead against their policy of discrimination on the basis of race and region; he was on a complete fast for seven days until the government withdrew a sectarian law. But on the downside his own people distanced themselves from him as he was asking for equal wages for Asians, African and European workers. His resolutions in support of Indian independence, unity of East African workers, revision of educational policies in India, release of Baba Gurmukh Singh and Teja Singh Sutantar were refused to be presented in the Gurdwara by Sri Guru Singh Sabha. Married to Satwant Kaur in 1934, he had had a son in 1937 who was named Hindpal Singh. He named his second son as Swarajpal Singh. He took an active part in the successful Mombasa general strike in 1939 and the following year he visited India with his family to apparently attend the wedding of his brother-in-law. However, disguised as a Muslim on May Day he addressed 30,000 textile workers who were on strike in Ahmedabad demanding better wages. He was arrested after a week and remained under detention for about five years. Instead of enjoying the fruit of freedom in India, he chose to leave its shores on August 22, 1947. Makhan Singh’s real problems started on his return to Kenya. He got an order of deportation from the British government citing his entry as an act of oversight, despite the fact that Sudh Singh had already got permission from the British Government for his entry. He got support from members of British parliament and the Government of India. He was lucky that the Supreme Court ordered the government to try him in a court of law before deportation; and the case fell flat on technical grounds. The government again came back with a fresh deportation notification. Such frequent orders, arrests and releases between 1947 and 1950 filled him with iron resolve and his image soared sky high; he was reckoned as one of the front runner freedom fighters of the country. He had already translated Marx’s Das Kapital while in detention in India and had also worked with Jagjit Singh Anand in publishing the weekly Jang e Azadi from Jalandhar. Though he had been writing for local Swahili and English media since 1935, the establishment started taking him very seriously only then. He opposed the celebrations when Nairobi got the status of a City on the ground that the town was clearly divided between the ‘poor’ and the ‘rich’ and the poor can’t be the part of such festivities. 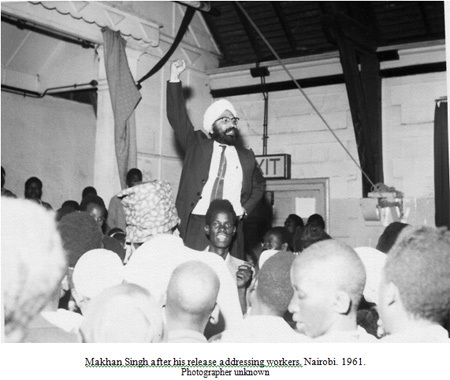 It was on May 1, 1950 that speaking at Nairobi’s Kaloleni Hall, Makhan Singh became first individual in Kenya to demand “Complete independence and sovereignty of the East African territories – Uhuru Sasa.” He was arrested and remained in jail continuously for 11 years, without a proper trial and was released only after Kenya got independence. An ardent votary of communism, Makhan Singh also showed complete faith in and adherence to non-violence. The fierce Mau-Mau movement, which left thousands of Kenyans dead at the hands of British, took place when he was under detention. We cannot find his parallel in history; no other communist fought against the colonial rule so peacefully and successfully. In his later life he turned an atheist but he wrote a number of poems on varied subjects, including Guru Nanak and the apostle of peace Guru Arjan Dev. He recited his verses also in gurdwaras, Sanatan Dharma and Arya Samaj Temples. Makhan Singh was impressed by Mahatma Gandhi. Though he never faced apartheid personally as Gandhi did; yet he decided to fight for the cause of Africans, unlike Gandhi. He decided to stick to Kenya under all circumstances, again unlike Gandhi. He didn’t waver even when his mother died in Kenya and the British were ready to release him only if he agreed to leave the country after the ceremonies were over. But he gave more importance to his adopted motherland than to his biological mother. The perception that Makhan Singh was denied any post-independence role in Kenya because he was a communist is misplaced. Actually the manner, in which land ownership rights of poor Africans remained with the western grabbers, exposes the myth of sovereignty. The subsequent incidents in post-colonial era in Kenya affirm the sham called freedom. Under new regime a number of frontline leaders were either murdered or detained; few others were deported. They include Pinto Pio Gama, Tom Mboya, J M Kariuki, Pran Lal Sheth, Oneko and Odinga. Anti-corruption man Bildad Kaggia was humiliated for his honesty, and the most honest Makhan Singh was simply ignored. He falls in the league of Gandhi, Mandela and Martin Luther King. But in contrast to them he is like sunk ebony, the valuable wood; its weight drowns it; whereas the straw swim so easily. Makhan Singh was a member of the Communist Party of India, a Stalinist party. His involvement in national liberation struggles was entirely in line with comintern policy, ie Russian imperialism. Your chronology is off in at least two ways. Makhan Singh joined the CPI in India in the 1940s, but he was involved in the early stages of Kenya's first multi-racial trade-union in the 1930s aged around 25. You could argue he was a Stalinist aged 25 before joining the CPI, but him joining a few years later may or may not indicate that. The USSR also continued to supply oil to Italy after its invasion of Ethiopia (1), (2). So really it was interested in stable (capitalist) relations with capitalist states. Kenyatta went to the USSR early on, but not sure whether there was any post-war support for national liberation in Kenya by the Comintern. Obviously they did support a tonne of different national liberation movements from the '50s onwards (often ones that would slaughter communists (and even Communists), like Mengistu), but the big general city-wide strikes Singh was involved with were in '39 and '47-'50. So that's a bit of a weird geopolitical (or alternatively, red-baiting) take to make when there's plenty of criticisms to make of Singh's actual politics, like his support for Kenyatta, who was opposed to the strikes he organised: The Spectator spotted that at the time. We could say the same for Labour voting dockers in the 1940s UK, only to have their strikes broken by the army, some of them were 'Communists' too, but the history of those strikes is still quite important.